Over 10 inches of snow fell here on February 1st. We hunkered down through the storm. When it was over the world was hushed under a blanket of pristine snow, at least until the snowmobiles came out. I don’t know what snow or being on a snowmobile does to people. Any surface covered with snow is an open range for the snowmobilers. They tear across the fields without regard for property lines or the damage they might be doing. Trespassing laws in Indiana are straightforward. While the laws go on and on for special situations, for open fields the law is simple: if the owner of the property has asked you to stay off the land, either in a personal communication or by posting a sign, and you enter the property, you are trespassing. Trespassing is a misdemeanor in Indiana carrying penalties of up to 1 year in jail and up to $5000 in fines. You may think, what does it hurt? How does a snowmobile running on top of a foot of snow do any damage? Those farmers are just cranky oldsters, yelling at the dang kids for cutting across the lawn. It can hurt the snowmobilers. 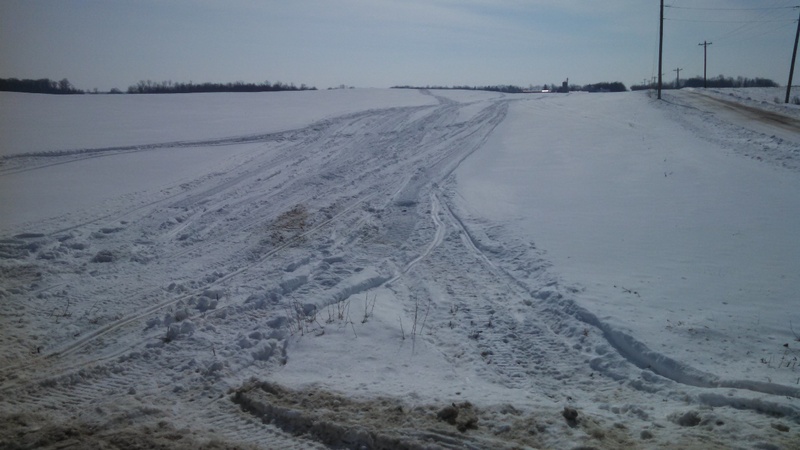 Farm fields aren’t groomed snowmobile trails. When blanketed with snow the fields may look smooth, but they’re not. There are hazards and obstacles hidden under that snow. In one of our fields two snowmobilers riding side by side managed to just skirt by on either side of a drainage tile that had broken and left a hole 10 feet around and over 4 feet deep. If either of them had been just a couple of feet to the right or the left they would’ve come to a very abrupt stop when they punched through the snow covering that hole. The laws are also very straightforward about who is liable in those cases. A landowner can’t dig a trap and camouflage it. But a landowner is not expected warn trespassers of safety hazards, and a trespasser will be liable for their own injuries. It can hurt the livestock. Our neighbor grazes his cows in the fields through the winter. He divides the fields up with a single strand of electric fence to control where the cows graze. Last week a snowmobiler who was less smart than a cow didn’t see the fence and blasted right through it. Fortunately our neighbor found the gap in the fence before the cows did. It can hurt the crops. The picture with this article shows one of our wheat fields. There’s wheat under that snow, dormant now, but it will begin grow this spring when the world thaws. We’ll harvest it this summer in July. You can see I’m not grousing about a single snowmobiler taking a loop across a fields. 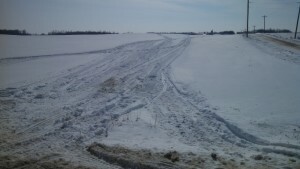 Numerous snowmobilers have used that field for a highway. It’s hard to see in a black and white photo, but if you look carefully the dark area in the left center is where they’ve gone all the way through the snow and churned up soil and wheat. This is how we make our living and snowmobilers are tearing it up to have a little fun. I don’t want to be the cranky old guy yelling at people who just want to have some fun. I don’t want to call the sheriff, and I don’t want to see anyone get hurt while riding on our fields. Just be a good neighbor and only ride where you’ve been invited. It's not high technology, it's just nuts and bolts.